For eight straight years we have published reports on real estate supply and demand in Tallahassee, and for all of this time our message has been a consistent one, warning of the over-supply of homes for sale in Tallahassee. Home values declined during this period, and the recovery from the bottom a few years ago has been sluggish due to this over-abundance of homes. But a milestone has finally been achieved that allows us to report some better news for the month of July 2015. For the first time in roughly nine years, the relative supply of homes for sale in Tallahassee has dropped below seven months of supply. Yes, it is still a buyer's market, in fact, we still have a glut of homes at the higher price ranges, but the overall picture is the best we've seen since 2006. We consider a market in equilibrium (balanced between sellers and buyers) when the relative supply of homes measures at 6.0 months of supply. When supply is higher than this, we call it a buyers market, as there are more sellers than buyers. The opposite is true when supply drops below six months, we refer to this as a seller's market as demand out-paces supply. Our first real estate graph shows that we are within sight of equilibrium. In the graph above, the red line measures real supply every month (number of homes on the market), while the green line measures the number of closed home sales each month (note the spike last month). Using the average demand over the past year, the relative supply is calculated each month and shown as a blue vertical column and measured on the left vertical axis. Finally, the one-year trended average of this relative supply is shown as a blue line. Currently, there are 6.7 months of supply of homes for sale in Tallahassee. That is much lower than the 8.0 months of supply reported one year ago. More importantly, our current trend (blue line) is the lowest it has been since we began this report in 2008. When we consider that 6.0 months of supply is normal, then a normal month of home sales should be about 1/6th of the current supply. This next graph compares the number of homes sold each month against the amount of supply available at that time. 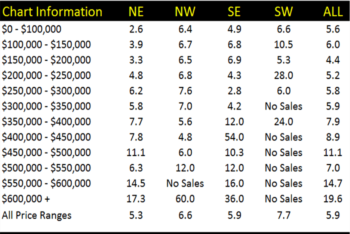 The yellow bar shows where we would expect most months home sales to occur. 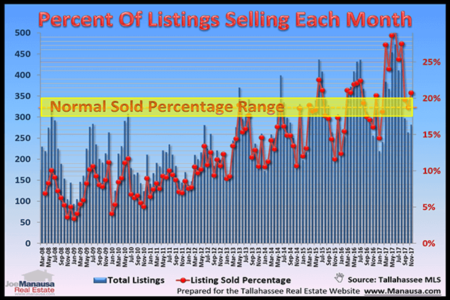 Due to seasonal factors in the Tallahassee real estate market, we would expect most of March through September to be above this range, while most of October through February would fall below it. For years, we never saw home sales anywhere near this "normal" range, but look at what we are seeing now. The past four months have been above the range, and last month soared to an 8+ year high, with 22% of the inventory selling during the month of June. This is good for Tallahassee. Every month, we provide a free report that can be downloaded and carried around (or kept in a tablet). It contains the relative supply of homes for sale in each area and each price range in Tallahassee. The supply and demand for homes similar to the one you want to sell or buy determines how aggressively you will need to negotiate. As a seller, should you expect multiple offers? For buyers, are you competing against other buyers? Understanding the numbers will allow you to negotiate a better deal. AS A MINIMUM, I would expect my Realtor to explain the relative supply of homes to me for every transaction, every offer, etc. If you would like your own copy of this month's report, simply follow this link to the download page.